The deadline for requesting Credit by Demonstrated Mastery is December 20th. Click here to learn more. Credit by Demonstrated Mastery is a state policy, which allows students working at an advanced level to earn course credit for high school courses by going through a two-phase assessment process. Any 7th or 8th grade parent who is interested in learning about this process may request an informational brochure and student application at the school office. Information is also available on the DCS website. 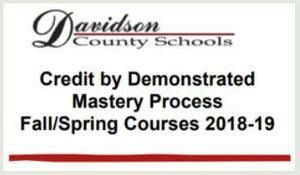 The deadline for requesting Credit by Demonstrated Mastery is December 20th.